You may add additional time to allow for more guests. Each add on is 30 minutes and costs differently per party package. If you need this add on you will need to ask for it upon booking, as scheduling the time will have to be done prior to the date of the event. 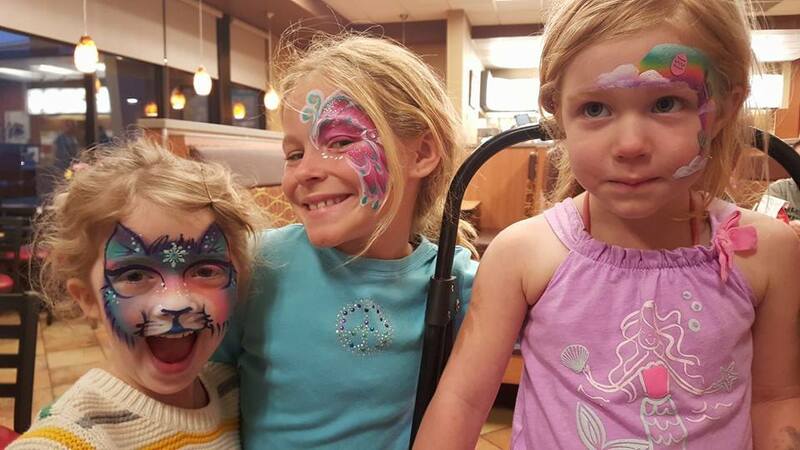 At Clementine The Amazing Face Painting & Entertainment Services, there are several artists are different levels of ability. All artists are amazing and have to undergo several trainings before passing Clementine's personal approval to go out and work for the public. Clementine has the most face paint experience of the group and this allows for a lot more design knowledge and ability, as well as speed. If you would like to have more faces painted in less amount of time, Clementine should be your artist. You may luck out and have Clementine scheduled to do your event/party, however if she ends up being scheduled elsewhere you will have a lead artist replace her, unless you have paid the special request fee. Ultra bling add on is great for an EXTRA WOW factor! 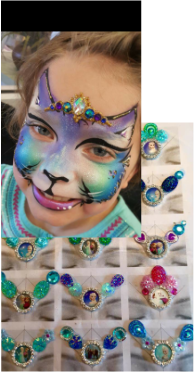 These pre-made jewels clusters and glitter gel add a 3-deminsional effect to the face paint designs. Each cluster can be tailored to the theme of your party, including characters of all kinds. The Ultra Bling is added to the face paint designs with skin safe products, and meant to last until you wash the design off. Some clients save their clusters for the next time we see them and they can be re-used. 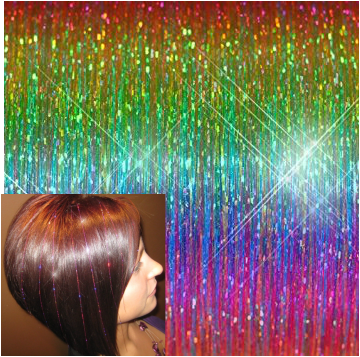 Hair tinsel is so much fun, looks great with braids and can be in the hair up to 3 weeks! With each add-on you can offer 4 strands to each guest at your party. We have several colors and varieties to offer, even a few colors that glow under a black light! These beautiful feathers are added using a crimping bead, and can last up to 4-6 weeks! Such an awesome add on for ANY party package. When you choose this add on you can offer a group of 2 feathers per guest, per add-on. Each feather is one of a kind and we offer several crazy colors and natural colors, as well as synthetic options for people with feather sensitivities!